Landing a reader in the age of information overload takes skill and awareness. Have you been fishing for readers? What bait would attract the strongest and largest audience for your writing? In order to write a great lead, you have to know your audience, just like the angler has to know the fish. What does your reader pursue and devour so you can bring them into the boat of the story – hook, line and sinker. The internet prompts people to read fast and because everyone is busy, they will not read much if they aren’t hooked by the first paragraph. When you write, take a little extra time at the end to go back and polish the beginning of your piece. Engage the reader with a question, an impressive statistic, a joke or a word picture. Then give a swift overview of the article. This will help the reader determine if the article meets their needs and they will read on through the rest of the story. Bait the story with something irresistible to get the reader racing through the whole story – hook, line and sinker. Any angler knows that if you put the right bait in front of a hungry fish, they don’t just taste the bait, they swallow everything they can get – all the way up the line to the sinker (non-edible). Next-Step-of-Faith writers have a mission – to bring Christ to the reader and create that hunger for the companionship of God in the life of the reader. The Gospel message is worth your best bait. Many beginning writers start writing chronologically and are glad when they get to the end of the story. 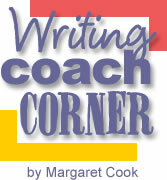 More experienced writers carefully craft the beginning and the end of an article. Maybe they tie the ends together to bring the story full-circle, or maybe they draw the reader in at the beginning and catapult them to some action at the end of the story. Take time in your revision process to rework the beginning of your article. Create a lead that will draw the reader into your story, not with gullibility, but with the strength of the Holy Spirit to lead them to an encounter that produces a Next Step of Faith. Remember that Jesus called us to fish for people and invite them into the kingdom by what they see in our lives. Copyright © September 2007 – Margaret Cook. All rights reserved.